Cooper Lake is flooded with fish, but hardly anybody fishes there. I’m here to give North Texas anglers a wake-up call. 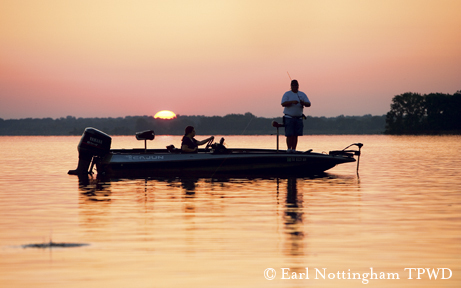 Just half an hour’s drive north of Lake Fork is an 18-year-old reservoir with excellent largemouth bass, white bass, catfish and crappie fishing and what may be the best hybrid striped bass fishing in this part of the state. And yet on the average day 19,000-acre Cooper Lake is practically devoid of anglers. The reason has to be simply lack of awareness. I don’t know of many anglers who wouldn’t enjoy catching five- to 10-pound hybrids cast after cast, or having two-pound white bass swarm topwater lures. Cooper disappeared from anglers’ radar in 2006, when the lake level fell so low it was impossible to access the lake. Record rains in 2007 refilled the lake and flooded terrestrial vegetation that had grown up in dry areas. Finding baitfish — primarily gizzard shad — is the key to finding hybrids, says Cooper Lake guide Tony Parker (903-348-1619). TPWD has stocked 1.5 million hybrid striped bass into the lake since 1996, so there are plenty of them to terrify the shad. Cooper is subject to annual fluctuations in depth that average seven to eight feet. As a result, it lacks the shoreline vegetation that makes Lake Fork so good for largemouth bass (although Cooper does have lots of flooded timber in the upper end that is good largemouth habitat). Parker fishes for hybrids by finding them using his electronics, then offering them four-inch Sassy Shads in salty pepper or chartreuse or mullet-colored five-inch Storm Wild Eye swim baits. Both look like shad, and their effectiveness is enhanced by the fact the lake was closed to angling for a time. If there is a downside to the hybrid fishery on Cooper, it is that the hotter the weather, the better the bite. Zoe Ann Stinchcomb and I fished with Tony Parker in August 2008 during that string of 100-degree-plus days that wilted most people’s desire to do anything outdoors. As we head across the lake, we seem to have it all to ourselves. 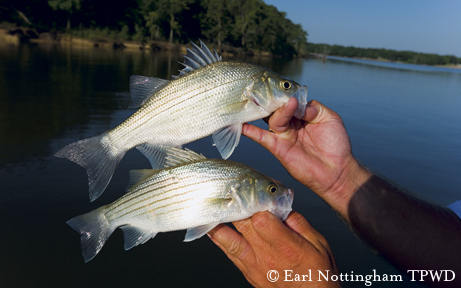 I recall that writer Noel Coward said that only “mad dogs and Englishmen go out in the midday sun.” Perhaps he should have included deranged hybrid striper anglers. Even the boat on plane does not generate enough breeze to keep us comfortable. It’s going to be a miserable afternoon. But misery is made more bearable by catching fish, and although they don’t start biting for a couple of hours, we have a ball, albeit a sweaty one. Parker ties a chartreuse Sassy Shad on one rod and a Storm Wild Eye on the other and has us drop them to the bottom, then jig them up and down by raising and lowering the rod tip six inches or so. Hybrids gobble both, and several times we have a double on, and twice a triple. I’m used to seeing deep-bodied hybrids, but these brutes are in a class by themselves. They take drag, jump, run under the boat and generally behave badly. Late in the day we see another boat in the distance. But the sight of seriously bowed rods is irresistible, and after a while the boat wanders over. One of the anglers hails us. “We’ve never fished this lake before,” he begins, and in short order Parker has clued him in and even tossed a package of Storm swim baits over. Another angler has become a Cooper convert. Rounding out Cooper’s attractions are the two state park units located on the north and south shores of the lake. Both the Doctors Creek Unit on the north shore and the South Sulphur Unit on the south shore offer campsites and screened shelters, but the South Sulphur Unit also has furnished lakeside cabins, deluxe screened shelters with air conditioning, equestrian sites and two lighted fishing piers. The fishing piers make it possible for boatless anglers to sample the crappie fishing, which Parker says is fantastic in the winter. Live minnows or crappie jigs work well, especially along “the wall” at the Heron Harbor day-use area in the South Sulphur Unit. Anglers with boats target crappie in the flooded timber on the upper end of the reservoir. While we are reeling in hybrids, Parker tosses out a teaser that assures I will be coming back to Cooper next summer. Having a five- or six-pound catfish slurp a fly off the surface has to be as much fun as having a hybrid slam a bait on the bottom — maybe even more. 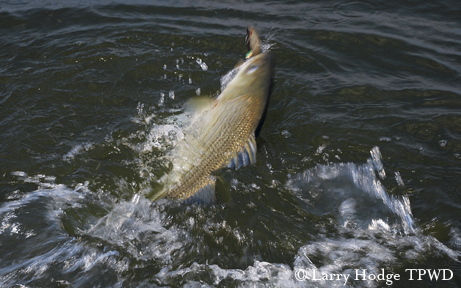 Cooper seems primed to remain an outstanding hybrid striped bass fishery for some time to come. TPWD stocked approximately 200,000 hybrids in both 2007 and 2008, and Jubar says he is planning another big stocking in 2009. Jubar notes that Cooper fares well when compared to better-known East Texas lakes like Takawoni. And it’s not just hybrids, Jubar points out. He fished the lake a couple of weeks before Zoe Ann and I did, and he was enthralled. Ironically, Jubar says, the one thing Cooper needs to keep it an outstanding fishery is more anglers. Wake up! This is no dream! Cooper needs you — now.